4/20 might be a "special interest" day for smokers and marijuana advocates, but for those who truly love smoking culture, this gallery of unique pipes, vapes, and smoking gear could be your go-to happy place all year long. On a bad day. When you need some inspiration. And, of course, anytime you're high. The pipes, vaporizers, and accessories I've pulled from the archives are distinct either in their design, materials, or use. Many of them are handmade pieces, some one of a kind, and one just the most "eruptive" device I've ever had the please of partaking in. So smokers of the herb and admirers of beauty alike, please enjoy my compilation of standout and special pipes, vapes, and smoking gear. Note: Smoking paraphernalia prices are listed as they were at printing. Prices are subject to change. Roll-uh-Bowl is your foldable, portable, indestructible bong on the go. A waterpipe for the adventurer, the backwoods trekker, the beach bum, the guy who drops, knocks, and sits on things a lot. Roll-uh-Bowl folds and stores just about anywhere when not in use thanks to its 100% silicone composition, and will inject no toxins into your body other than those summoned up by your herb of choice when lit thanks to its 100% silicone composition's Grade VI healthcare rating. Ergonomics aren't just for desk chairs and keyboards anymore. Stoners need their specialized tools to feel comfortable during repetitive and long term use too. 'Cause what good is smoking a bowl to alleviate the pain of arthritic fingers if your fingers are too arthritic to grasp a BIC and flick it lit? The Toker Poker is a lighter case with a groovy ergonomic design. Literally. The dips and curves of the case are intended to conform to those of a gripped hand, as well as add some girth to the lighter inside to make reaching and rolling its spark wheel feel more natural. And it's not just the Toker Poker's shape that's thoughtful. This handy tool also includes a stainless steel poker and tamper built right into the sleeve. The poker folds out from the side, and the tamper juts out from the bottom corner. A wide channel at the bottom of the tool can also hold up to 5' of hemp wick, which the closed poker secures in place. Sorry, hippies and artistic stoners. Now that marijuana is this close to mainstream acceptance, and not that much farther away from broad legalization, it's time for the techies and trendsters to move in and take over the conception, design, production, and marketing of its associated paraphernalia. Oh, and the profits. Definitely, definitely the profits. This is how they'll spin it: "A look into existing cannabis products reveals the absence of a brand that connects with the mature, style conscious, and forward thinking market that has emerged." And then they'll show you the Aura. Spin: "Designed to appeal to both existing and new users, Aura evolves the water pipe into a contemporary object that is comfortable in plain sight." Translation: It's a bong. Made by techies and trendsters who don't want to be misconstrued as checked-out slackers when they segue their weed smoking hobby from private to public spaces. But I think it looks nice. Casual Strain's line of T-shirts aren't made of hemp and they don't contain built-in smoking apparatuses. And thanks be to God Bob, Willie, Woody, and Snoop Dogg for that. What they do contribute to the world are some stellar contemporary designs and just a little bit of weed education. Each of Casual Strains' 5 T-Shirts features the name and an artistic interpretation of a popular breed of cannabis. They might also be the most comfortable, well-wearing T-Shirts I've ever worn. A PIPEMUG, as you may have deduced by its name and photo, is a mug with a pipe in it. Even better, while the two are inextricably bound, they are also mutually exclusive. So you can take ZANG! 's advice and "sip it and rip it" in a 1-2 punch, but without risk of cross contamination. $25 to $45 ➠ ZANG! MagicalButter, or MB2, is a kettle-sized device that extracts the THC from cannabis (plus botanicals from other herbs if you're into that sort of thing) and incorporates it into base ingredients for elaborate feel-good drinks, entrees, and desserts. Or just a nice piece of feel-good buttered toast. In a few simple steps and the literal push of a button, the cooker's micro-processor controls will draw out the herbs' botanicals and fold them into butter, oils, and alcohols. It can produce both food and skincare products in as little as 2 hours. If you're looking for a hitman, sorry, this collection of machine guns is made of glass. But if you're looking for a hit, man welcome to the bong-themed weapons trade. Or would it be the weapons-themed bong trade? Either way, these machine gun pipes are here to leave your brains intact, while absolutely blowing your F'ing mind. They're like what would happen if someone stitched together Full Metal Jacket and Up in Smoke. Die Hard and Harold and Kumar. Super Troopers and...Super Troopers. A pipe both mesmerizing and calming. Hand-blown with eight loping tentacles and buggy eyes that seem to promise years of ambivalent companionship. An Andromeda Glass Octopus Pipe will serve as an emblem of the chapter in my life that will thrive on chillness and peace of mind, and refute instinctual anger and violence. What? Well...I don't know what I just said either. When this Volcano blows, I promise, the only havoc it's going to wreak is on your ability to touch your finger to your nose and make the L O N G 25-foot journey to the kitchen to get that half gallon of Moose Tracks you're ready to devour. I mean devour. The Storz & Bickel Volcano Vaporizer isn't even close to the newest desktop vaporizer on the market, but I think most avid inhalers will agree that few, if any, that have come after it can touch its dominance in the herbal refreshment arena. The Volcano is able to extract the best (i.e., most potent particulates) of herbs, spices, and essential oils through gentle, precisely controlled heat that won't burn them, and that doesn't require much user manipulation, trial and error, or prayer to the gods of cannabis. Once rounded up, the Volcano mixes the extracts with air and pushes them into an inflatable balloon bag for consumption. It may look like a complex piece of Dr. Jekyll handiwork cooked up to squelch Mr. Hyde (and indeed the Volcano could be a very good accessory in calming the beast in all of us) but its usage learning curve is low, and number of steps from handful of matter to lungful of magic few. Norman Osborn and Beaker from The Muppets are going to have a conniption when they get a load of this Frankencreation of welded steel and glass. 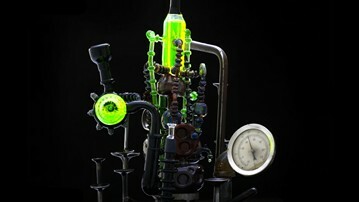 The Menagerie of Mechanized Happiness Machine - ahhh, its name alone evokes reverence--is the steampunk-lovin' chem lab stoner's eternal soul mate. And even for the rest of us, it may be the marijuana accoutrement of the century. I hear Santa Claus sacks of weed actually line up outside the door begging to be stuffed into and puffed out of this otherworldly vision of science, art, and getting high. Happy 4/20 indeed.